Welcome to the biggest guide online of How to dress like the Californication character Hank Moody. Learn about everything he wears from accessories to his distinctive black leather jacket. Signature look: Black T-Shirt and dark denim jeans paired with a sport jacket (Dressed Up) up or a leather jacket (Casual) and of course his signature sunglasses and dark boots. In Season 6 of Californication Hank is wearing a pair of Ray Ban RB8301 002/N5 TECH sunglasses with black shades. In the opening episode of Season 5 of Californication. Hank Moody is wearing a pair of Persol 714 sunglasses. These glasses are real classic. 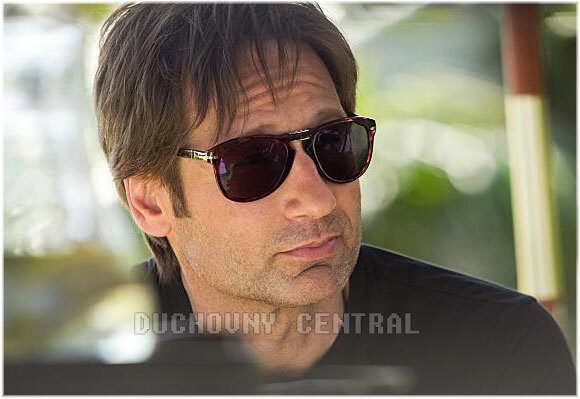 You can get these Hank Moody Persol 714 sunglasses. Hank is wearing the Havana frame/brown glass version but they are also available in black. Hank Moody is wearing dark denim straight cut jeans and more often than not they are Earnest Sewn Men’s “Fulton” Classic Straight Leg Jeans. However, sometimes he wears Levi's Men's 501 Original Fit Jean, Dark Stonewash. More info here. Posed by David Duchovny in popular TV serial Californication, this Hank Moody Leather jacket purely portrays the soberness of a person. Created with elite quality synthetic leather, this jacket has snap collar which opens to a zipped front. 2 side slit pockets and long sleeves with snap buttons makes it simple and elegant. Piping designs throughout the front, back and sleeves gives it a classy appearance. You can adquire here a replica of the Hank Moody Jacket. Sometimes brown but mostly black. In season 3 of Californication Hank Moody is wearing Timberland Men's EK Brook Park Chelsea Boot. Available in both colors.